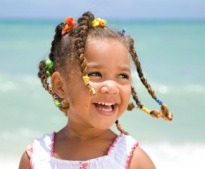 Relaxing your child's curls may seem to be the easier option but chemically hair is more prone to damage and breakage. Use Tear-free products to make bath time more enjoyable. Children skin can be more sensitive to some products. Organic products may be more gentle for your little one. Moisturize daily. It will keep hair hydrated and more manageable. To de-tangle hair start from ends of hair and work upward toward scalp. For thick hair, make sections in the hair and de-tangle one section at a time. Do not blow dry your baby's hair. It will cause more frizz. Air drying is better but if you are in a rush, use a diffuser. After a swim in the pool, shampoo and condition curls to prevent damage caused by chlorine. Use hair accessories without metal as hair can catch on metal and cause breakage. Never brush curly hair. Curly hair is more delicate than straight hair. Brushing will roughen up the hair's cuticle, separate curls, and cause frizz. It also promotes split ends. Use only wide-tooth combs. The best combs for any hair type are seamless handmade combs. Handmade combs are often made of a plastic that glides through hair without promoting static. Regular plastic combs have seams that can snag hair and cause damage. If you are caring for a toddler or baby's curls and a wide-tooth comb is too big, choose a small seamless handmade comb. Shampoo a child's curly hair only once a week. Wet hair and apply a gentle moisturizing shampoo. Massage the shampoo into the hair and rinse thoroughly. Follow the shampoo with a moisturizing leave-in conditioner. Detangle the child's hair with the wide-tooth comb. Let hair air dry to form curls or use your fingers to shape curls. During baths between shampoo days, rinse the child's hair with pure water. Wet hair and then gently massage the child's scalp to remove any debris. Rinse again with water. Add leave-in conditioner and comb through the curls to detangle. Shape curls with fingers. To revive curls or tame frizz: Fill a spray bottle with distilled water. Wet your child's hair. Add a small amount of leave-in conditioner. Form curls with fingers. To remove tangles: Saturate the tangle with leave-in conditioner. Gently use fingers to untangle the hair. If this doesn't work, take a spray bottle filled with distilled water and wet the tangled area. Next, apply a generous amount of leave-in conditioner to the tangle. Let the conditioner sit untouched for ten minutes. Carefully work out the tangle with your fingers. Only use hair accessories that will not snag in the hair. Look for smooth barrettes without rough edges. Elastics should not have metal parts. Moisturize: Jojoba oil is a good non-greasy moisturizer for all hair types, especially curly hair. Jojoba is actually a natural wax that closely resembles the sebum oils excreted from the scalp. Apply jojoba oil to your child's hair as a deep conditioner before shampooing it.